Tip: If you want to share the love of everything retail, gifts valued at $100 or less can be mailed (no more than one package per day), and do not need to be declared in the exemption. Catering to cruise ship passengers and resort guests, Main Street in Charlotte Amalie is lined with shops selling jewelry, perfume, liquor and souvenirs. Cardow Jewelers and Imperial Jewelers are good options when you’re looking for something sparkly. Explore Mango Tango Art Gallery for arts and souvenirs, as well as S.O.S. Antiques, which also sells many antique treasures with a nautical theme. The Vendors Palace is a large tent full of local vendors hawking their souvenir shirts, dresses, bags and more. How to Get There: As you leave the Havensight cruise port, exit left out of the Havensight Mall and follow along the Waterfront until you reach the U.S. Post Office. Make a right at the Post Office and a left onto Main Street. The trip takes about 10 minutes in a cab or 35 minutes on foot. Note: While most ships dock at Havensight, on busy days certain ships will dock at Crown Bay. Unless otherwise noted, all directions given are from Havensight. Use the Google Maps link for directions from Crown Bay. With more than 100 stores and business in Havensight Mall you are sure to find that special something to take home. Conveniently located right at the port, it offers good prices for jewelry, fragrances and watches. Diamonds International and Little Switzerland are two top choices for jewelry, while Dynasty Dazzlers sells jewelry, liquor and perfume. A.H. Riise is a duty-free goods “haven” with jewelry, cosmetics, perfumes tobacco and more. How to Get There: Walk right off the cruise ship and you’ll be at the outdoor Havensight Mall. St. Thomas’ second busiest port is home to kiosk stores for local goods, as well as jewelry, souvenir and liquor stores. Top stops include Anna’s Souvenirs for gift items, jewelry and general merchandise; Caribbean Choice for locally-designed jewelry; Supreme Liquors; and other outposts for Cardow Jewelry and Diamonds International. How to Get There: Shops are a five-minute walk from the Crown Bay port if you ship is docked there. If your ship is docked at Havensight, exit left out of the Havensight Mall and follow along the Waterfront until you reach the sign for Crown Bay Marina, and turn left. This walk takes about an hour, or you can take a cab for 20 minutes. The largest arts and crafts emporium in the USVI, this is the place to go for calabash bowls, spice racks from local wood, straw moko jumbie dolls, woven baskets, and quilts made by some 40 local artisans, including school children and senior citizens. Support the local community by purchasing some of these hand-made items. How to Get There: As you leave the cruise port, exit left out of the Havensight Mall and follow along the Waterfront until you reach Vendors Plaza, next to the U.S. Post Office. The Native Arts and Crafts Cooperative is across the street. It's 10 minutes by car, or a thirty-five minute walk. If you’d like to pair your shopping with some aspirational shopping for mega-yachts then head to Yacht Haven Grande. This upscale waterfront development features high-end luxury boutique clothes and accessories. Well-known names include Louis Vuitton, Gucci and White House Black Market. Bella Vera is a non-chain store for women’s clothing and accessories. How to Get There: As you leave the cruise port, exit left out of the Havensight Mall and follow along the Waterfront until you reach the sign for Yacht Haven Grande. Turn left into the Yacht Haven Grande entrance. It takes five minutes in a cab or 25 minutes on foot. For something unique, head to Zora for good quality and custom-made leather sandals, handmade canvas bags, luggage and backpacks. How to Get There: Exit left out of the Havensight Mall and follow along the Waterfront until you reach the Fort Christian parking lot and USVI Courthouse. Turn right and Zora will be on the left-hand corner at the next intersection, across the street from Roosevelt Park. It takes 10 minutes in a car and half an hour on foot. 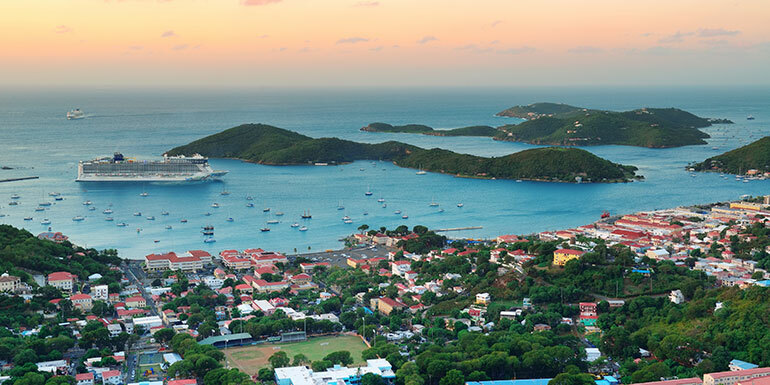 What's your favorite place to shop in St. Thomas? Crown Bay ?! You have to be kidding! 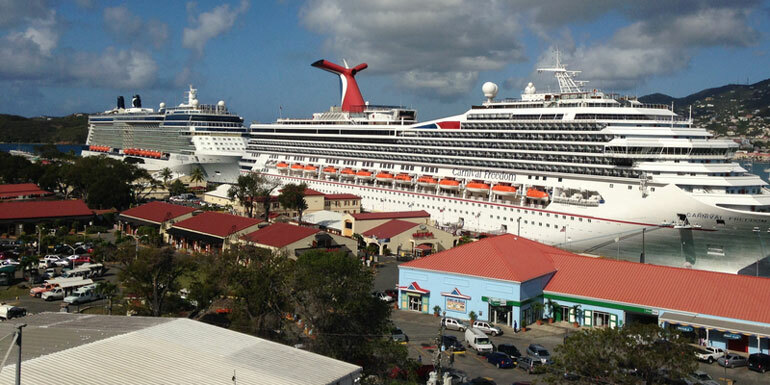 The last four cruises I took that called at St. Thomas docked at Crown Bay. Other than a few pier-side shops, there is nothing at Crown Bay! Translated - Crown Bay is isolated! 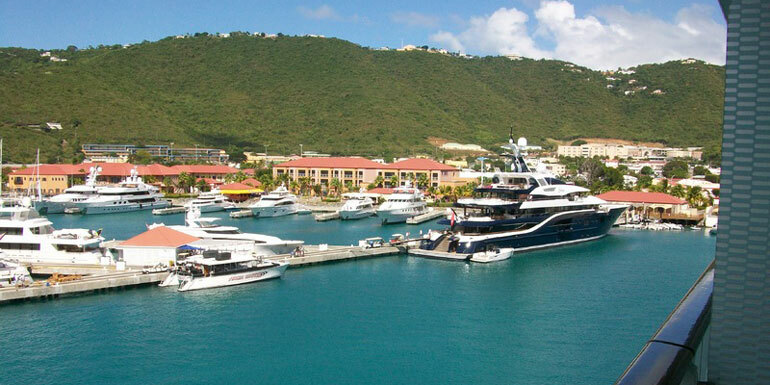 Unless desiring a long time-consuming walk, cruisers will need to take a taxi to get to Havensight or downtown Charlotte Amalie, both which have many more shops and activities than Crown Bay. Cruisers fortunate enough to dock at Havensight will have a big mall and other activities within easy walking distance of the pier, including the St. Thomas Skyride which the photographer clearly took in order to take the lead-in photo at the top of this page. I have expressed my concerns to Holland America and Princess about docking at Crown Bay instead at Havensight to no avail. To you cruisers looking forward to great shopping without the need to take a taxi that have the misfortune of docking at Crown Bay, you have my sympathy.